Slip-on box cover with a lenticular image of the original album cover. 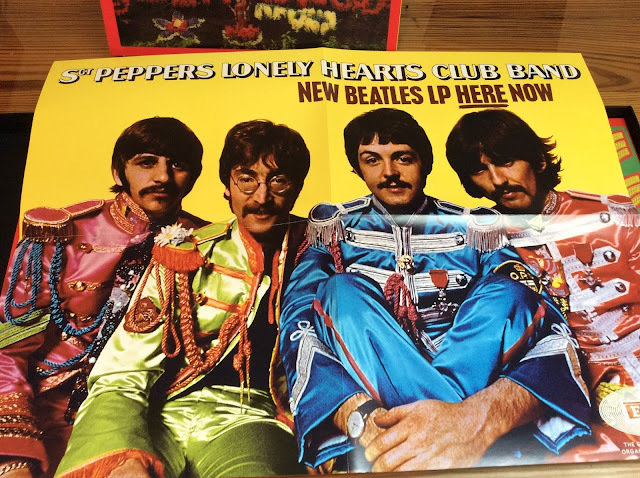 The original cover photo session employed cardboard cut-outs arranged around and behind the Beatles to give a sense of depth to the photo. I think presenting the photo as a lenticular image is an inspired idea as it amplifies that 3D depth they were going for. This year I got one of the most awesome Father's Day gifts I've received – the "Sgt. 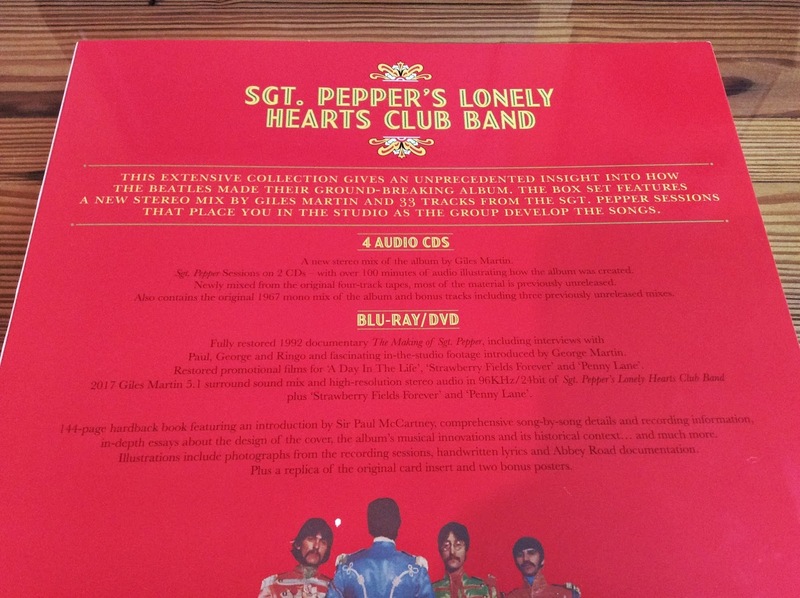 Pepper's Lonely Hearts Club Band 6 Disc Super Deluxe (Anniversary Edition)". A jawbreaker name for a jaw-dropping gift. 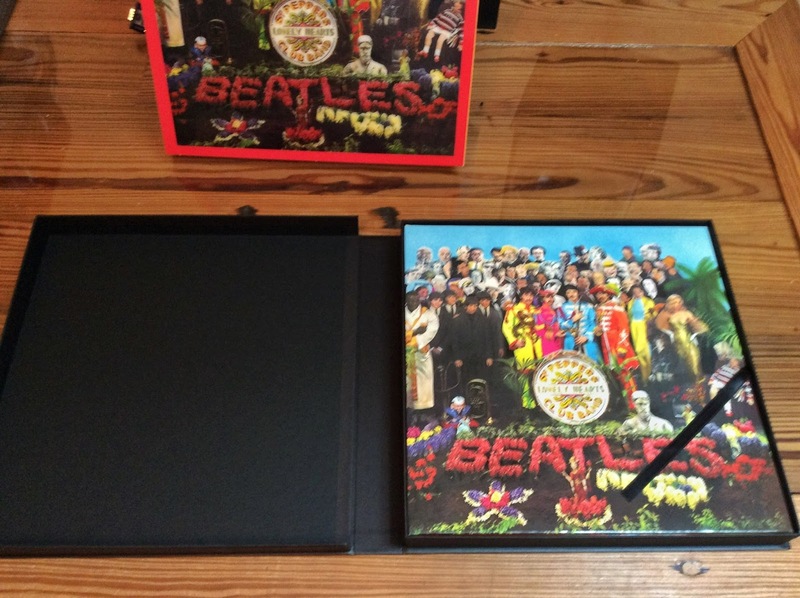 This is most thoughtful and impressive box set I've ever seen. Not that I'm an expert on box sets, but it really is marvelous. 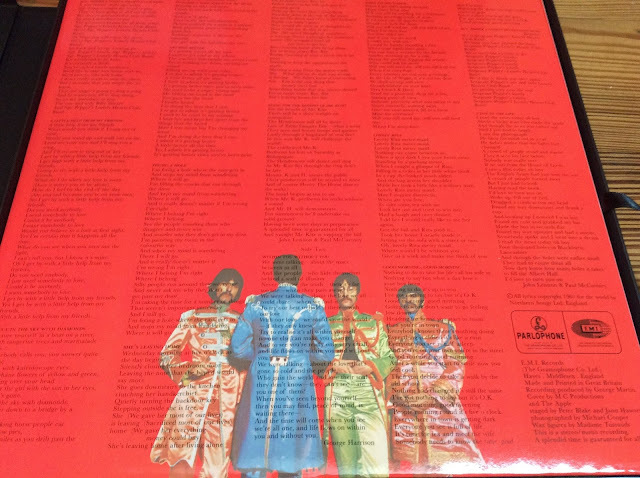 The original mono mix released in the UK, which is the definitive version for purists. A new stereo mix by Giles Martin. 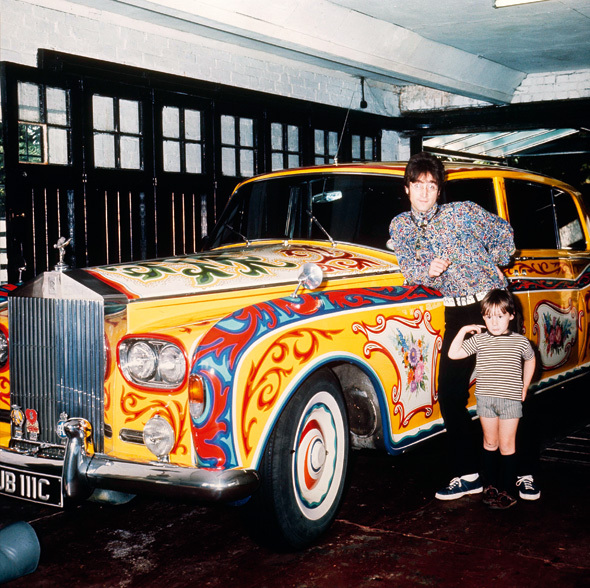 It's well-known that the Beatles and George Martin considered the mono mix the final product (stereo was considered a novelty at the time) and put their effort into that. A stereo mix was created for the US, but it was a rush job that didn't actually involve the Beatles or Martin. Giles Martin, using the original mix as a reference, re-mixed the album for this box set. He used the original equipment for an authentic sound, which is extraordinary in itself. But was also able to create a much clearer mix partly because he could sync multiple 4-track tape machines and didn't have to deal with generational loss from the multi-track bounces that they had to do in the '60s. His mix is also less idiosyncratic mix. If you listen to an original US release of the album, there is some very odd (by today's conventions) panning going on. (As a musician, I actually kind of liked that because it isolated individual parts and to me, it fit with the whole psychedelic vibe of the record.) Giles' mix presents a more natural stereo image. 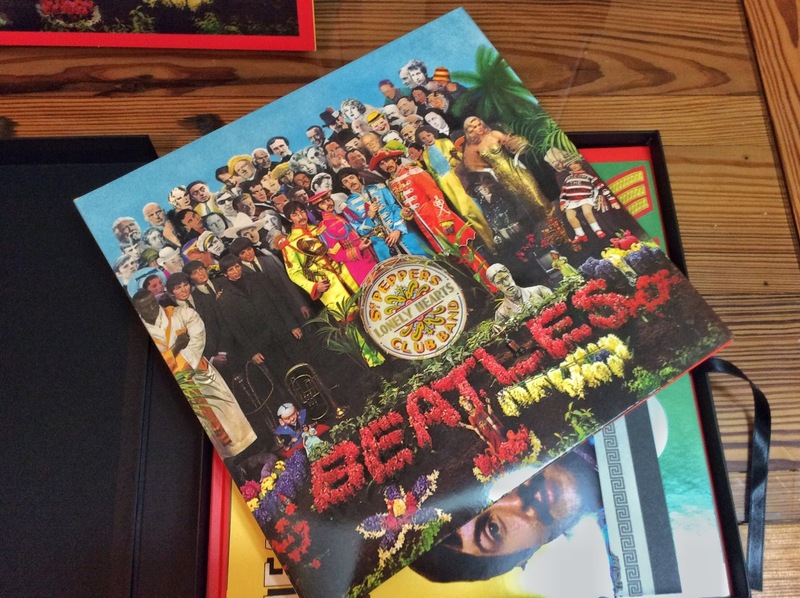 I'm not a purist, although I do love the original mono mix too because it's forever connected to my earliest and best musical memories. I like that they included both. 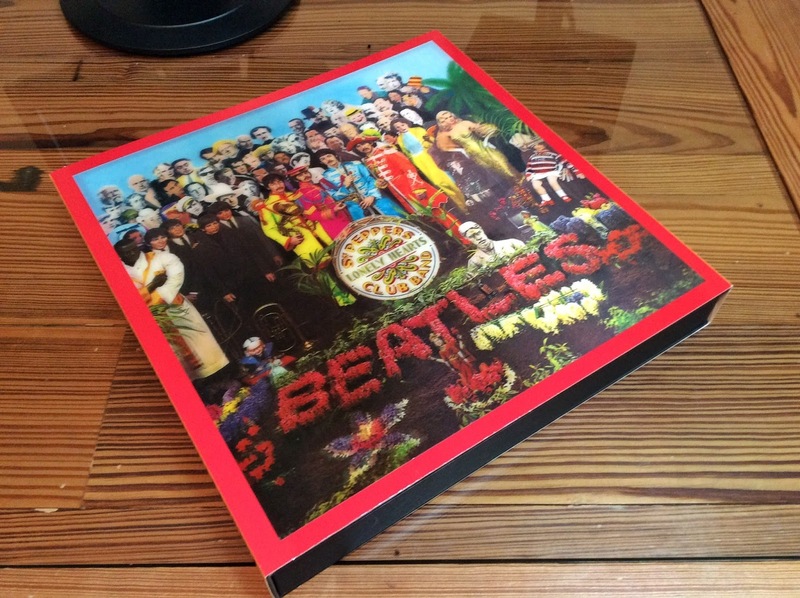 A 5.1 mix of the album, as well as Penny Lane and Strawberry Fields Forever. This one could to be a lot of fun too (haven't gotten to it yet) if they took advantage of the instrument placement possibilities: Wouldn't it be cool if as a listener, you were placed in the middle of the band, with John on you're left, Paul on your right, and so on? The potential for greater clarity and instrument separation is intriguing, especially with this album. 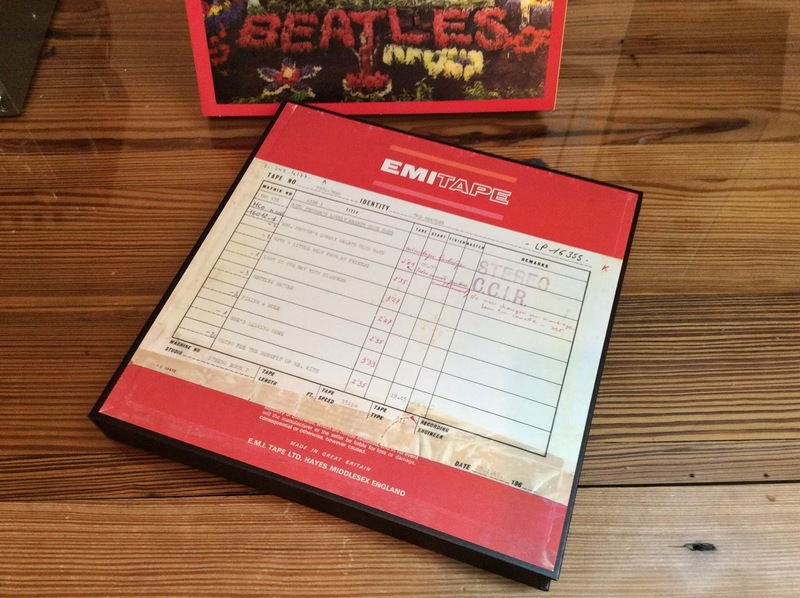 Some early, unreleased mono mixes of She's Leaving Home, A Day In The Life, and Lucy In The Sky With Diamonds. A bunch of incidental recordings, outtakes, and individual tracks and track groups from the studio sessions, most of which had been previously unreleased. 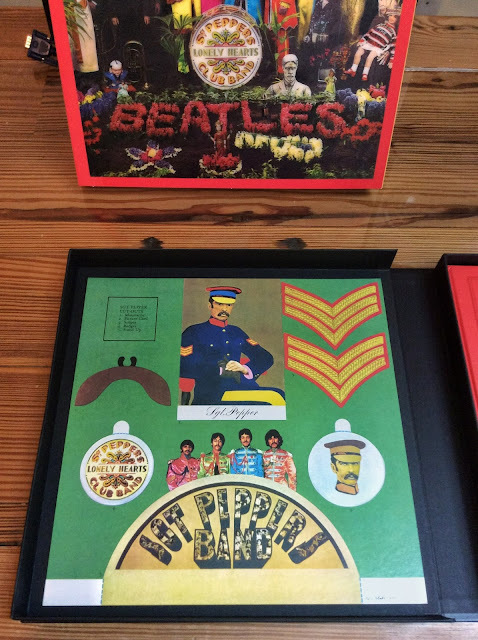 Restored 4K promotional films for Strawberry Fields, Penny Lane, and A Day In The Life. The recordings are wonderful, insightful, and delightful. But the whole package is impressive with terrific extras, thoughtfully presented in period-correct psychedelia. Rear of the slip-on box set cover. Under the cover, the actual box for the set is a replica of a storage box for a multi-track tape reel from the recording sessions. Very clever! All the contents are in the box, which is well-made and has a pull ribbon to make it easy to get things out. The CD, DVD, and Blu-Ray media are in a folder that mimics identically the original album cover. Rear of the media folder. This brings back fond memories of my sister's copy of the LP! A print of one of the promotional posters used in the original release and included in the box set. I particularly like this inclusion. It's a reproduction of the 19th century circus poster that John Lennon purchased from an antique store in 1967. 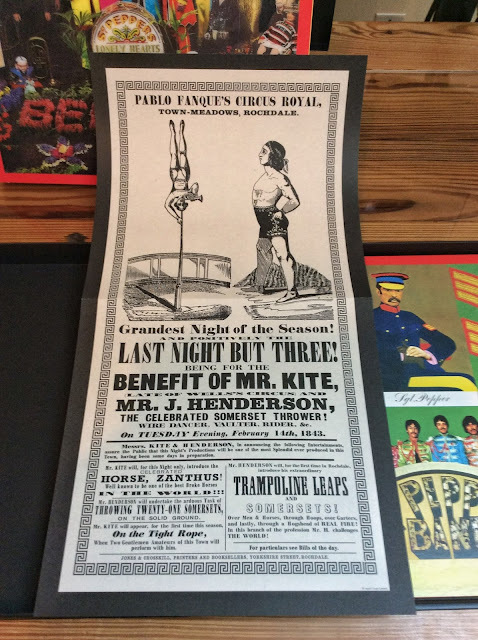 The lyrics for Being For The Benefit Of Mr Kite! were largely lifted from this poster. I've long been fascinated with the back story and have always wanted a print of this poster. I intend to frame it and hang it in my studio. The original release included some playful cutouts. I'd read about them, but had never actually seen them. They're reproduced for the box set. I like the fake mustache with nose clip, which acts as a theft deterrent. 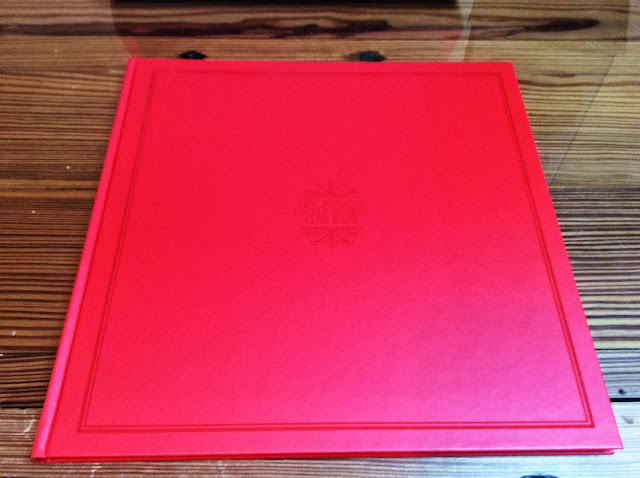 The box set also includes a 144-page hardcover book covering the album from a number of different angles – song histories and recording notes; the iconic cover art; musical innovations on the album; and historical context. 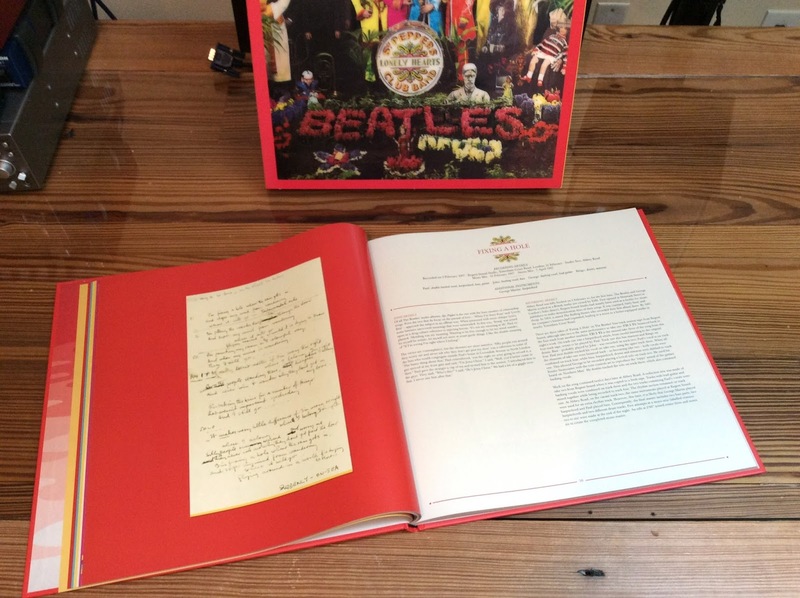 The written content is fascinating and insightful (for Beatles nuts anyway) and written by the right people. The book is well-produced and peppered with copies of hand-written lyric sheets, studio and record company documents; and photographs from the sessions. 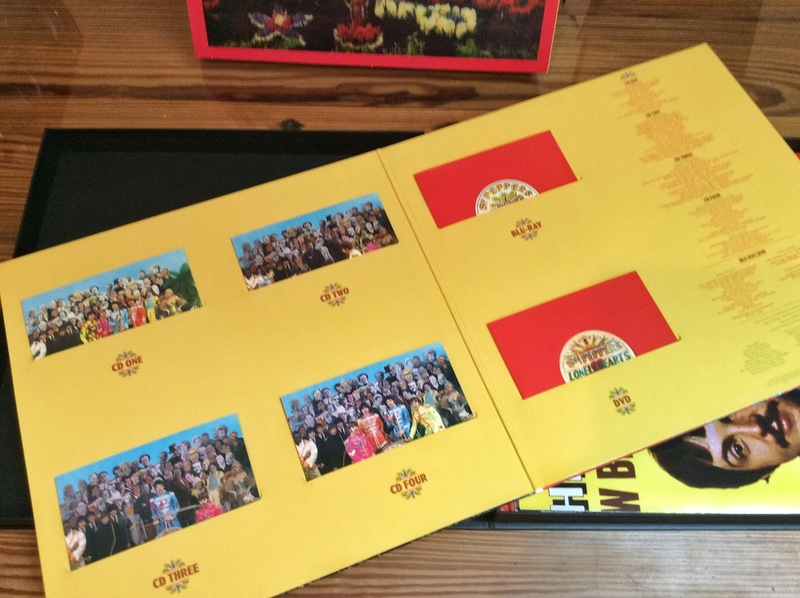 And the graphic design is perfect – it looks like a time capsule from 1967 with lots of primary colors, psychedelic imagery, and period-correct layout, typeface, and design. The book's endpaper (the fancy paper that lines the inside of a book cover and forms the first and last pages) is a reproduction of the paper used for the inner sleeve of the LP in its original release. You can just see the edge of the endpaper on the left side of the book in the photo above. It's a psychedelic pattern of waves in various shades of red. It was designed by The Fool - the Dutch graphic design group heavily associated with the Beatles and the swinging '60s. 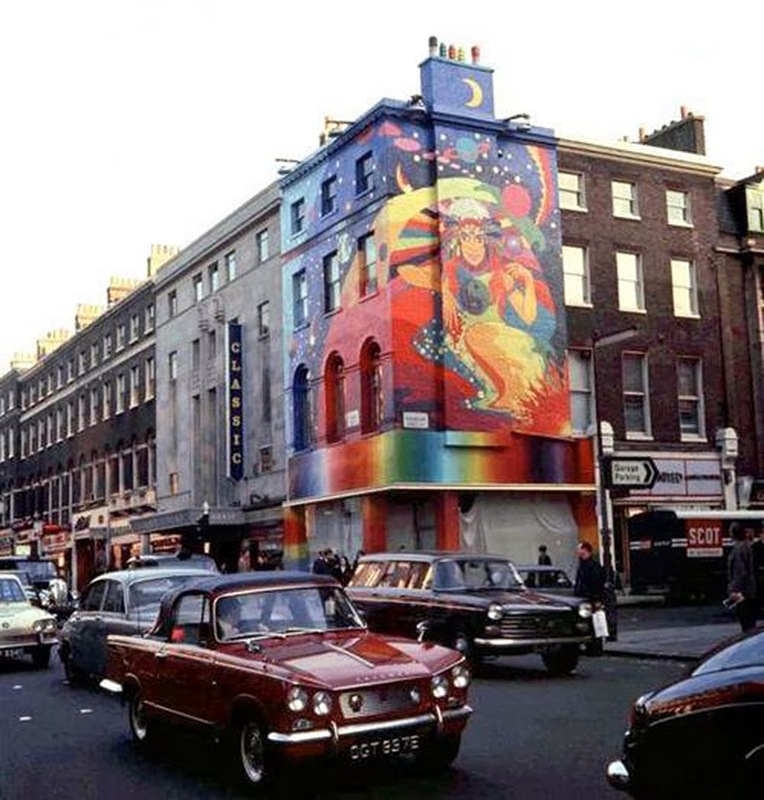 They were responsible for a lot that era's most famous rock art, including Eric Clapton's famous Gibson SG; the Beatles' Apple Boutique mural ; Lennon's groovy Rolls Royce, and lots of album covers. All in all, a most amazing Father's Day gift! There is enough material to keep me busy for months and yet I'm certain I'll find new things every time I listen – very much like the original album!